Eva and James Howe… and their house. 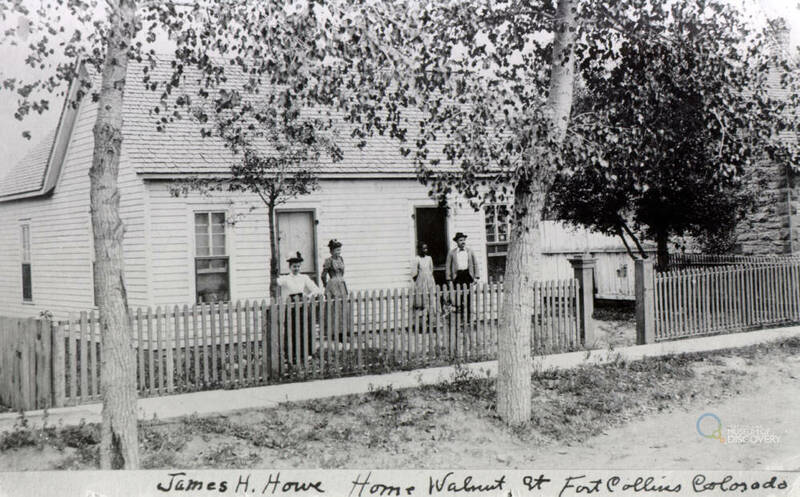 In 1880, James and Eva Howe moved to Fort Collins where they eventually built a small one-story bungalow on Walnut street. Eva was a dark eyed beauty with a sweet and forgiving disposition. James was a millwright of great skill, but he had a penchant for drink. Though Eva was devoted to James and had been married to him for over 15 years, she finally reached a point in April of 1888 where she could take no more of the mean streak that came upon him when he was drunk, and which usually found its outlet upon her. On Tuesday, April 3rd, James beat Eva so soundly that she finally went to the police. They wanted to put him in custody, but she insisted that all she wanted was someone to stay near the house so that she could get help if needed. On Wednesday, she begged James to stay home and not go out drinking. He left anyway. That’s when Eva decided that she had to get herself and her 5 year old daughter to safety. She was in the process of packing up her things when James arrived home unexpectedly – and drunk as could be. Outraged that Eva was leaving him, James knocked Eva about until she fell out of the front door of the house. Though it was hard to hear over the strong winds that day, a neighbor still heard Eva’s cries of “murder!” and went to investigate. By the time of his arrival, James had knocked Eva to the ground, stood over her, and stabbed her in the neck. Eva rose, stumbled out the gate and headed towards Linden street continuing to cry out until she died. The neighbors who had witnessed all of this first went to check on Eva, then one ran to grab the doctor while the others went into the house and found James sprawled on the bed, covered in blood. Though at first James claimed that it was Eva who had tried to stab him with the knife, everyone knew that to be a lie and so they dragged him off to the jail house. Eva was dead by the time the doctor came. Her husband had hit her jugular vein and she quickly bled out. Later that evening, the lights to the entire city went out. Soon after, a mob broke into the jail, busted open all of the locks, and dragged James out to the street. In fear and remorse James cried out for mercy, but the mob dragged him over to the court house on West Oak Street and there hung him on a gallows that had been prepared for that purpose. It was the only lynching ever to take place in Fort Collins. The temperance movement had been active in Fort Collins for almost 10 years at this point. The day after the murder and lynching, the small note shown at left had been inserted into the newspaper on page 4. 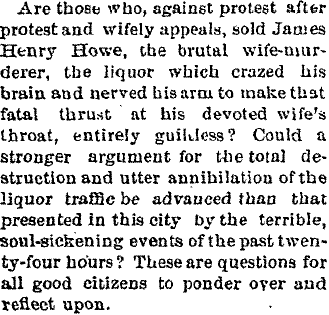 The story of James and Eva Howe became a temporary focal point for the movement, which saw alcohol as the root of many evils. Their efforts stuttered along for almost two decades until, in 1909, Fort Collins became a dry town. It remained that way until the law was repealed in 1968. The house as it looks today on West Myrtle. Eventually, another family moved into the house that had been home to the Howe family on Walnut street. And as the city grew and businesses needed space in the center of town, the Howe house was lifted from its foundation and moved. Around 1910 the house was hauled just a few lots over to the intersection of Walnut and Chestnut (where the new Elizabeth hotel stands today). In the 1950s it was moved to a neighborhood “on the edge of town” where it still stands today (though it is no longer the edge of town). You can see the Howe house at 1314 West Myrtle, looking almost exactly as it did back when Eva and James lived there. One of the front doors was covered over, but you can even see the faint outline of the door still visible just behind a trellis. With all of the growth taking place in Fort Collins these days, I think it’s interesting to take note of how expansion was done once upon a time (at least in this case). Rather than tearing down the house and replacing it with an auto repair shop (which is what eventually took its place), the house was moved to a new location so that it could continue to be used. This is a far more sustainable answer as it requires little or no hauling away of debris and therefore no addition to the landfill. It also requires the use of fewer natural resources. Though new materials would be used to create the auto repair shop, no new materials were required to make the house that now resides on West Myrtle. What better example is there of a truly Green Building? Although I read about the Howe story in “Howe” did this get here? 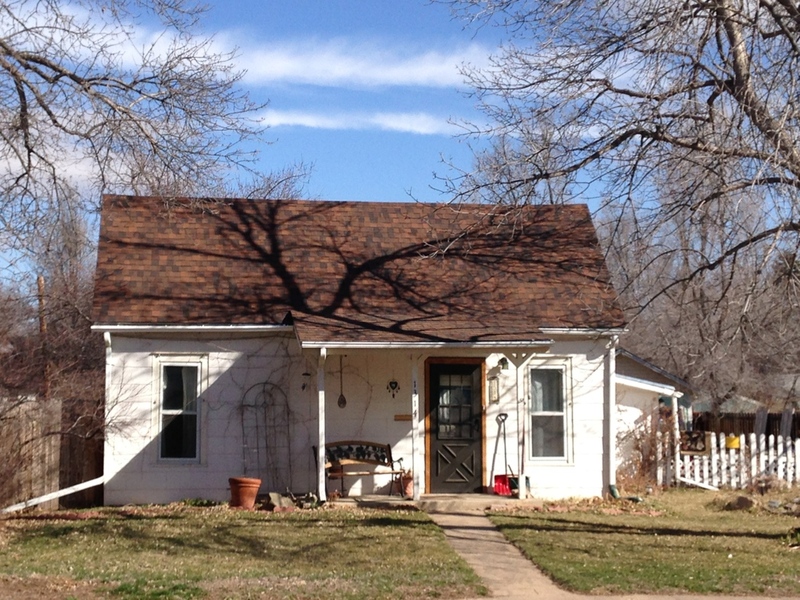 Part 2: Finding the trail of the Howe lynching (More to Explore: The Fort Collins Museum & Discovery Science Center Blog.) and in Ansel Watrous’s History of Larimer County, it wasn’t until I read the Fort Collins Courier front page article from April 5, 1888, the day after the murder and lynching, that I felt like I really had a good sense of Jame’s and Eva’s story. The newspaper article included not only a description of what happened, but also eye-witness accounts and the doctor’s report. Dates on when Fort Collins was a dry town came from this timeline posted by the Fort Collins History Connection. This article was originally published on March 24, 2014 on my former website, North of Prospect.